Why should I use cutting and kitting services instead of doing them myself? This is the classic "make vs. buy" decision that each business must answer for itself given its own unique circumstances and situation. Cutting and kitting sound and look simple, but require significant investment (labor, space, tools/equipment, etc.) and know-how to do right and cost-effectively in volume. We've already made those investments and have many years of experience satisfying many demanding customers. A key thing to consider is the "opportunity cost" in doing it yourself ... that is, consider what you could be doing and investing in - such as merchandising, marketing, selling, serving your customers - instead of doing the cutting and kitting yourself. Do you have quilting and sewing expertise? Suggesting and making improvements that help and simplify things for the consumer. What kind of kits can you make? Simply put: pretty much any kit you want. 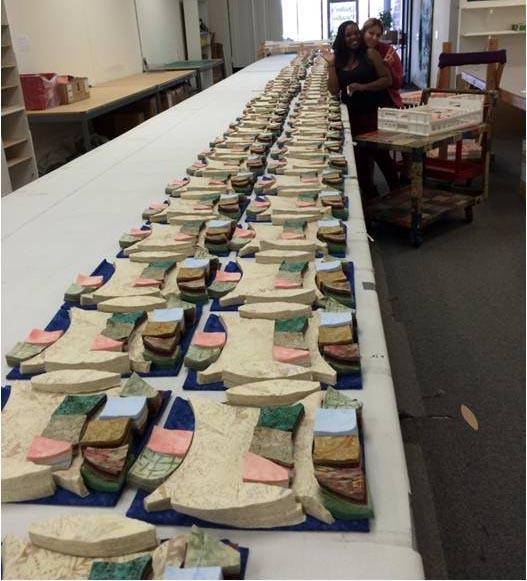 We are the only company that can offer the full range of pre-cuts and kits - and in large volumes. 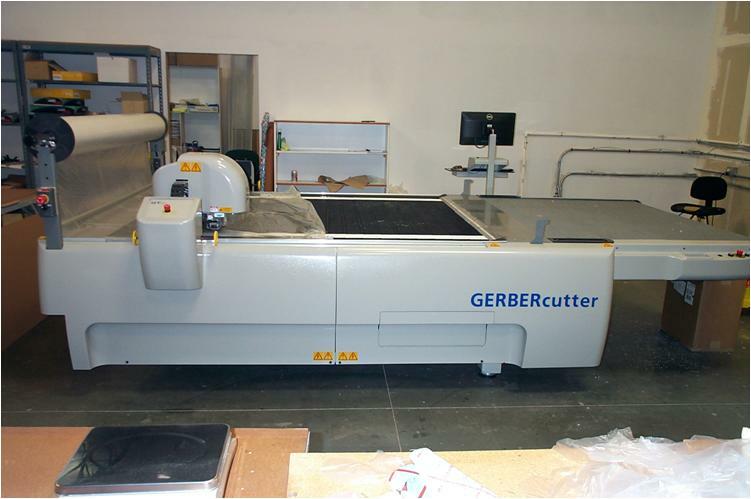 Not only do we make standard pre-cuts, such as 5" and 10" squares, 2-1/2" strips and fat quarters, but our computer controlled Gerber cutter can cut virtually any shape you want including half-square triangles (with the tips cut off), rectangles and hexagons ... even curved shapes such as circles, Drunkard's Path, melon ... and much more! For kits, we make cut yardage, laser-cut appliqué, and fully pre-cut pieced kits. Production costs - this is the cost of production based on the design. The total production cost depends on the materials used, how many items you want, and whether there are other preparation, packaging or handling requirements that we must take care of. We provide you a free, written cost estimate based on the design you submit to us that you want cut. It depends on the size and complexity of the job as well as what is already scheduled for cutting. However, once we have all the materials in hand, the great majority of jobs are completed within 2-3 weeks, 1-2 weeks for smaller jobs. When we prepare a cost estimate for you, we will also give you an estimate of how long it will take us to complete the job. If you require a job to be done on an expedited basis, we will attempt to work this out with you. Please be sure to take into account shipping times when doing your planning. How are materials and goods shipped to and from you? We can accommodate receiving and shipping a few boxes, to many pallets to a full shipping container. Shipments from FedEx, UPS, USPS and a number of trucking companies come to and go from our facility every day. We will work with you to determine the most cost-effective method to meet your needs. How do I determine how much yardage is needed for a project? Based on the quantity that you require, we will do the calculation for you. That calculation takes into account the cutting layout that we develop that optimizes the use of the fabric and it also takes into account the need for a small amount of overage to account for such things as fabric flaws. Can you take bolts and rolls of fabric? Yes. In developing the price for your job, we will tell you whether bolts or rolls (aka ROT which stands for "Rolled on Tube") are preferred. To save time and shipping costs, can I have a manufacturer ship fabric and materials directly from their warehouse to your facility? Yes! This is something that's routinely done. And, we are located near a number of well-known fabric manufacturers. Also, to save time and shipping costs, can you drop ship directly to my customers or fulfillment centers? What do you use to do the cutting? What we use depends on the job's requirements. If all that's required is to cut yardage from a bolt or roll of fabric, this is generally done using electric hand cutters or possibly a rotary cutter. If specific shapes are being cut, we our state-of-the-art lasers and Gerber Cutters. These machines are computer controlled and are very accurate. As summarized in the table below, each machine has certain attributes and strengths that make it more appropriate for some jobs than the other. Cutting Area Size 18" x 24" 70" x 80"
Can be extended using the "cut and advance" feature. How do these machines compare to die cut machines? The biggest difference is flexibility and speed: both the lasers and Gerber Cutters are computer programmable meaning they'll cut whatever shape you draw. And, they cut quickly and accurately. By contrast, a die cut machine uses fixed size and shape dies. If you want to cut a particular shape, you need to have a die that exactly matches that shape - which may require the manufacturer to make a custom die for you (assuming they're willing). Also, except for costly, higher end commercial die cut machines, a human must physically operate the machine to make it cut. Years ago, we owned an AccuCut die cut machine which was great for low volumes of a limited number of shapes, but not appropriate for higher volumes. How large of a piece of material can be cut by the machines? The size is limited by the size of the cutting area - see the table above. Organic - cotton, wool, leather, silk. Synthetic - polyester, rayon, nylon, vinyl leather. Additionally, our lasers cut acrylic plastic (aka plexiglass). Who provides the fabric and materials for the kits? When performing a service job, the customer provides the fabric and materials (e.g., pattern, notions, embellishments). Once we lay out how the job is to be cut, we inform the customer how much yardage is needed based on the desired quantity of kits. Packaging materials can be supplied by either the customer or by us; this is something that we discuss with you up front. Packaging is important to me. Is this something you will work with us on? Yes! We understand that "presentation matters" and, hence, packaging is very important. We also understand that there are cost constraints and so the goal is to find a solution that both presents well and is cost-effective. We spend time up front with you to understand your requirements and what you want to achieve. Then, we work with you to come up with the best possible packaging solution for your project. What packaging capabilities do you have? Bags and boxes - there are many, many types of bags and boxes and we will work with you to explore options and select the best alternative. Shrink wrap - we own and operate a shrink wrap machine. Banding - we own and operate a banding machine that can wrap a product with a clear plastic band. Tying - as an alternative to banding, a product may be tied using ribbon or twill. Labeling and tagging - we work with you to determine what labels and tags, if any, need to be applied. Barcoding - if your product needs to be barcoded, we can help you with that. We use high-quality, cast acrylic plastic that is commonly referred to as "Plexiglass". Rulers and templates use 1/8-inch thick acrylic which is the same thickness as the rulers and templates quilters and sewers use with a rotary cutter to cut their fabric. The most common colors, by far, that we use are clear and transparent fluorescent green (a yellow-green). Other colors are possible upon request. What do I need to provide you to cut a template or ruler? Ideally, what we need is a drawing that is to scale. (Inclusion of dimensions and angles is always helpful.) A "vectorized" computer drawing is best: preferred file formats are ai, cdr and pdf; other file formats, such as dwg and dxf can be provided. If a hardcopy drawing is being provided, it is best to do so on graph paper; however, our accuracy is only as good as the drawing. If what is to be cut is a very simple shape, such as a square or circle, you can simply provide us the shape's dimensions. If you want such things as words, numbers, lines or a graphic (e.g., your logo) engraved, we need to know exactly what you want. If you want one or more holes cut into the shape, such as for hanging the template/ruler on a pegboard or for marking purposes, these need to be specified. As mentioned above, the most common colors are clear and transparent fluorescent green, with clear being the less expensive of the two. Fluorescent green is a yellow-green and is best if there are markings that need to be clearly visible to the user. If you desire a different color, please let us know and we will work with you to find the best color. Yes! We have custom-engraved our CutRiteTM HandiRuler and have worked on several custom projects that will hopefully inspire you and give you an idea of the wide range of possibilities! 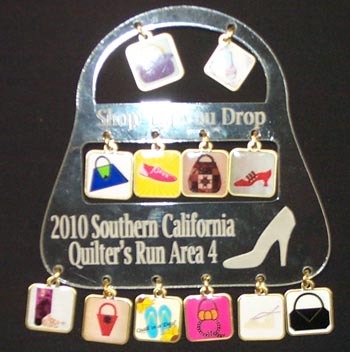 We have made name tags for companies and organizations, such as quilt guilds, out of clear, acrylic plastic with each individual's name engraved on it. We have made charm holders out of clear, acrylic plastic for quilt runs where each shop in the run gave away a free charm (see picture at right). A very popular product that we cut is purse/bag bottoms, cut to the customer's exact dimensions. Also, of note, the engraving is done on the back, or bottom, of the template/ruler to eliminate so-called parallax errors. When engraved this way, the markings are physically touching the surface of the material to be cut or measured. It doesn't matter whether you view the marking from an angle or straight down; the marking's apparent position on the material doesn't change thereby ensuring accuracy. However, if the engraving is on the top of the template/ruler, the marking is separated from the material by about 1/8". Hence, when you view the marking from an angle versus straight down, it's apparent position on the material changes slightly. 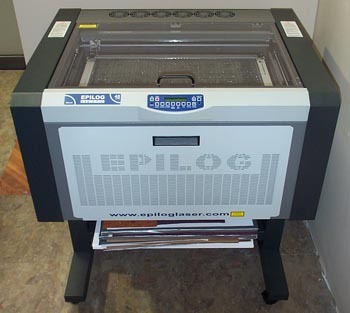 If you have a project that might benefit from our laser cutting services, please contact us for a free estimate!